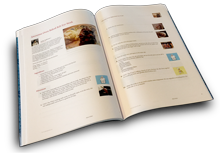 I noticed we all have recipes that our Grandparents made that will forever live on and I wanted to put a cookbook together in honor of all of them as they are the inspiration to those of us who follow after. I am so happy to hear of her recovery! Fiesty is good!! Thank you Jesus! Thanks for the good wishes for grandma, Tammy! She is out of the hospital now, and fiesty as ever! Great idea! She would really cherish that! Glad I can help to put a smile on her face! Oh, I was so busy looking at the pies I didn't even notice the corn chowder--thanks for including that too! I'm going to be trying that soon. It's not a bad idea to buy her her first cookbook. She's 12 and a half, and she lost her mother last year to cancer. All she has is a recipe file that belonged to her mom, and a few from myself and her other grandma. I'm going to present her with a cookbook or two on her 13th birthday--I think that would be fitting. And hopefully before then (June) we can share some more kitchen experiences. Thanks so much, Tammy, for printing "our" recipe and for giving me the idea for her birthday gift. Oh and I have your soup recipe in here too Ellen! It was just to good, had to include! awwwwe! She should be so proud of herself! What a beautiful gift she gave, something you could do together! This book would be such a sweet keepsake for her! I'm just tickled! You're welcome, Tammy. I just may have to purchase this one and give it to my granddaughter. I think she's secretly kind of proud of herself for being featured in a cookbook--lol! I hope your grandmother is getting better Martha, I really love her recipes and I really will be happy if this makes her happy! XXOO I will say some prayers for her. Thank you Carol, I really wanted to honor these wonderful ladies and I love the book too! Thank you for sharing your Mom's recipe with all of us! Thank you Ladies!!! I am sorry it has taken me a while to respond, I have been working alot lately and could only come on for short times. Aw, Tammy, how sweet you are! Thanks for including my recipe for My Lil Mini Pies that I made with my granddaughter. In this case, I AM the grandma! And we had such fun making those pies and sharing the day together. Tammy, I feel honored. Thank you.